Baron Victor Horta was born in Ghent, Belgium in 1861. He studied drawing, textiles, and architecture at the Academy of Beaux-Arts in Ghent, then went to Paris to work. He then returned to Belgium and drafted for Classical architect Alphons Balat. In 1890, Victor Horta set up his own firm. In 1893 he designed what is widely regarded as the first architectural expression of mature Art Nouveau, namely Tassel house in Brussels. His innovative use of exposed ironwork and open-plan space characterised Horta as one of the pioneers and leading practitioners of art nouveau architecture. He abandoned the neo-classical style of his schooling years in favour of an innovative art nouveau approach that built on irregular shapes and lush curved lines. He used exposed cast iron as a structural material; produced a centralized floor plan in place of the traditional corridor arrangement; and paid close attention to ornamentation. The Horta lines are exemplified in his most lavish private house, now the Hotel Solvay (1894) in Brussels. In public buildings such as the Maison du Peuple (1899, destroyed 1964), the Brussels headquarters of the Belgian Socialist party, he produced glass and iron facades that were some of the most advanced of the day. 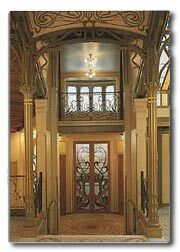 Baron Victor Horta art nouveau designs were an important European predecessor of the modern 20th-century International Style, particularly his use of exposed structural ironwork and glass facades.